The Schilke method of mouthpiece labeling has been designed to assist the student, teacher, amateur and professional in selecting a mouthpiece to meet the needs of the player. 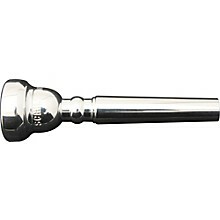 All mouthpieces come with standard rim shapes, cup volumes, and backbores unless shown otherwise on the mouthpieces. This method enables the player to know the characteristics of their trumpet mouthpiece. Example: a trumpet mouthpiece using this method might be called 9C3c. Using this example, 9 refers to the CUP DIAMETER Smallest numbers have smallest diameters C E. Large C refers to the CUP VOLUME A. Small Cup B. Medium-small C. Standard (medium size) D. Medium-large E. Large 3 refers to the RIM CONTOUR 1 Rounded 2 Semi-rounded 3 Standard 4 Semi-flat 5 Only slightly rounded c refers to the BACKBORE a. Tight b. Straight c. Standard d. Slightly curved out e. Large When a Schilke mouthpiece has a standard backbore, rim and cup, only the cup diameter (first number) is shown on the mouthpiece. In the example above only the #9 is necessary to identify the mouthpiece because the C is the standard cup volume, 3 is the standard rim, and c is the standard backbore. Whenever measurements differ from the standard sizes the alterations are shown on the mouthpiece. Most trumpet and cornet mouthpieces have a cap diameter that falls between .600" and . 725". Nos. 1 to 25 in the Schilke system represent sections of .005" each between these two measurements. Cup diameters for mouthpieces other than trumpet and cornet are relative to each other with the smallest numbers representing the smallest diameters. 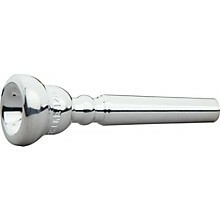 In general the deep cup mouthpieces produce the darkest sounds. In reverse the shallow cup mouthpieces produce the brightest sounds and also aid in the production of the high register. The Schilke "C" cup is a comprise which offers both full tone and ease of production. In switching from one instrument to another i.e., Bb trumpet to D trumpet, it is usually good to use a mouth piece that is .025" shallower in the cup volume with all other dimensions remaining the same. The higher the instrument is, the shallower the cup should be. 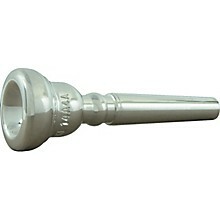 A player who needs primarily a good range without sacrificing much tone can consider a hollow mouthpiece with a widened 2nd cup. The shallow 1st cup affords support in the top register and the widened 2nd cup allows a full tone. The #3 Schilke rim has the feel that most players prefer in a rim. It has flat enough contour to distribute the slight pressure needed to provide an air seal but is rounded slightly to offer increased flexibility. Generally a rounder rim will allow greater flexibility but sometimes tires the player sooner. A flat rim often feels the most comfortable but tends to hold the lips in a fixed position, thereby reducing flexibility. Schilke mouthpieces all come with standard backbores (letter C) which permit the maximum in tone and range. Other backbores are available (Letters a, b, d, e) which might suit particular needs of players. The tighter backbores tend to make the sound more brilliant while the larger backbores tend to make the sound more mellow. Occasionally a change in backbores will cause an alteration in intonation which often can correct faulty intonation on an instrument.